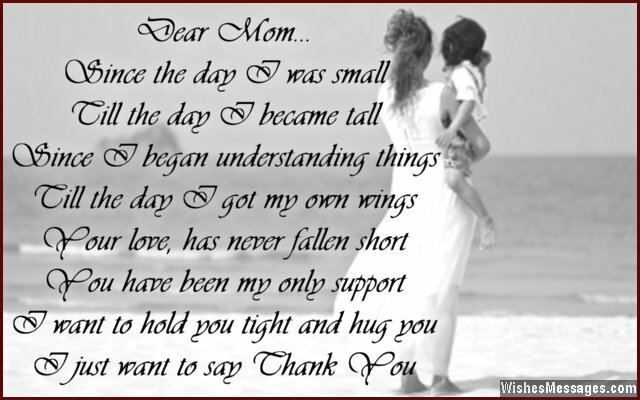 Thank You Poems for Mom: Irrespective of whether you are a rebellious teenager or a young adult marching ahead in life, spare a moment to do something that makes your mother happy. Stop waiting for her birthday or Mother’s Day – just walk up to your mom, give her a hug and say thank you for everything that she has done for you. Mark your gesture of gratitude with a sweet message, touching quote or a funny note written on a cute handmade greeting card. Post your short rhyme on Facebook for everyone to see. Don’t forget to take a selfie with your mom as she bursts into a beautiful smile, feeling blessed to have a child who loves her back as much as she does. If you haven’t realized the importance of your mom’s contribution in your life by now, wait till you have a son or a daughter of your own.